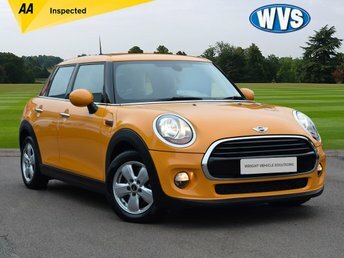 Stand out in this orange 2016 Mini Cooper 1.6 136 AUTOMATIC 5dr, 1 keeper from new with service history, 2 keys and an independent AA inspection report. 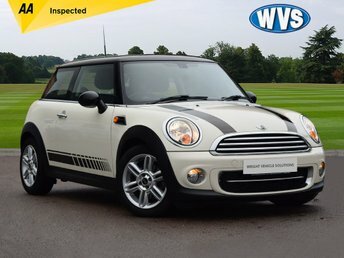 A very attractive low mileage Mini Cooper 2.0d 110 AUTO in white with a huge specification including - CRUISE CONTROL, CLIMATE CONTROL, DAB RADIO, BLUETOOTH, USB SOCKET, MINI REMOVABLE SAT NAV, BLACK ROOF AND MIRRORS, BONNET AND BOOT STRIPES. Complete with service records and an independent AA inspection report. Ready for a MINI adventure? Pay a visit to Wright Vehicle Solutions today and take a closer look at the full range of used MINI cars for sale in Bletchley, Milton Keynes. Whether you're looking for a fun city runabout like the MINI 3-Door Hatch or a stylish cabriolet such as the MINI Convertible, our team is ready and waiting to help. We stock affordable used cars to suit every budget and you can buy with confidence as each one of our vehicles is thoroughly inspected before going on sale. Discover more or arrange to take a test drive in the used MINI of your choice by contacting a member of the team at Wright Vehicle Solutions today.